Guignol - "Angela, David And The Great Neopolitan Road Issue"
Guignol is the trio of Jeremy Barnes of Bablicon and Laurence Coleman and Aaron Moore of Volcano The Bear, who met while their respective bands were touring together. Having heard both these bands I'd say that tour must have been an ideal pairing and it doesn't surprise me that the association resulted in collaboration among the members. The music on Angela, David And The Great Neopolitan Road Issue is an interesting combination of song and difficult to describe instrumental styles. "Of Houses And Canals" and "Invisible Sports" are the two most purely song oriented tracks of the set. The former is a calm and slightly haunting song, with light, airy vocals, backed by atmospherics and a simple yet expressive organ melody. "Invisible Sports" is similar, with a strange combination of OM chanting and wailing vocals that make for a wild harmony with a single pulsating organ note. It's really quite beautiful in an oddball way. The promo sheet says that it's based on a traditional Slavic song and reflects Guignol's interest in Eastern European folk music, though I detect an off-the-wall John Barleycorn vibe as well. There are some brief tracks which didn't make much sense to me ("Angela And David", "Discover Guignol Band" and "Snore Scene"). 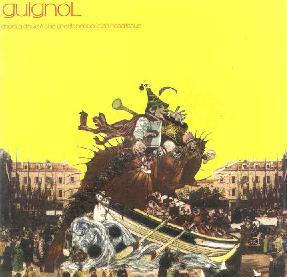 But Guignol's real strengths are heard on "The Fly Machine Passes" and "The Great Neopolitan Road Issue", which were my hands down favorite tracks of the set. "The Fly Machine Passes" opens with a sound that is based in both jazz and traditional ethnic stylings. But it's the mood that counts. The music is elusively intense, with trumpet and 2 or 3 layers of piano at the forefront, and there's a keyboard sound that has a distorted Sun Ra or Soft Machine circa Third quality. But after several minutes it transitions to a song that is even more overtly of the John Barleycorn variety or a traditional Celtic folk song. Very nice. "The Great Neopolitan Road Issue" begins with that avant-garde traditional ethnic song style that characterized the Art Bears, and indeed Dagmar's vocals would be great on this song. I love the combination of instruments, with accordion and quirky off-beat keyboard and organ melodies and rhythms dominating an atmosphere that is full of whimsy and fun. The music transitions fluidly through a number of themes and at times I felt like I was at a celebration hosted by a gypsy circus troupe. At 13 minutes, "A Gourd Question" is the longest track of the set, and one the one that I'm left feeling a little ambivalent about, on first listen having considered it weak in comparison to the others. But after several listens it started to grow on me, and certainly the magic of music like this is that it reveals new secrets and treasures with repeated visits. The song opens with extended wailing keyboard notes (I really dig that organ sound), clattering percussion and wind instruments... another of Guignol's enjoyably strange combinations... kind of an avant-garde free-improv atmosphere but it also has a Caligari like film score quality. The percussion eventually abandons the clatter in favor of more linear rolling patterns, and howling anguished vocals are introduced. After nearly 9 minutes the theme changes with a piano playing an oriental sounding melody with wailing chaotic horns in the background. But the horns quickly settle down and piano and acoustic guitar bring the music to a peaceful close. Lots of good ideas here but I guess it just didn't flow as seamlessly for me as "The Fly Machine Passes" and "The Great Neopolitan Road Issue" did. But overall, this album provides much that enticed me back for several spins. It's strange... simple yet complex... creatively constructed... fun... and with much to reward the attentive listener. For more information you can visit the Cenotaph Audio web site at: http://www.cenotaph.org. Contact via snail mail c/o John Fail/Cenotaph; PO Box 81941; Pittsburgh, PA 15217.